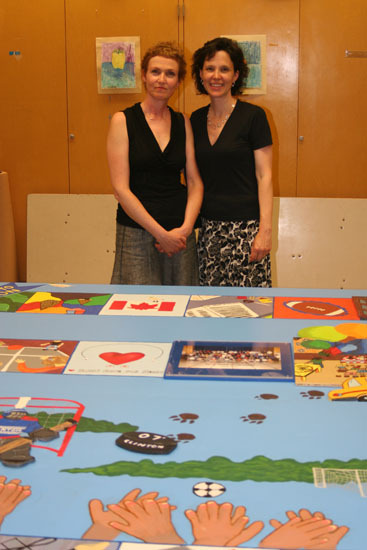 My work as an art educator is grounded in a holistic approach to the visual arts, one that includes all aspects of visual and material culture as a means to investigate and celebrate the creative process. 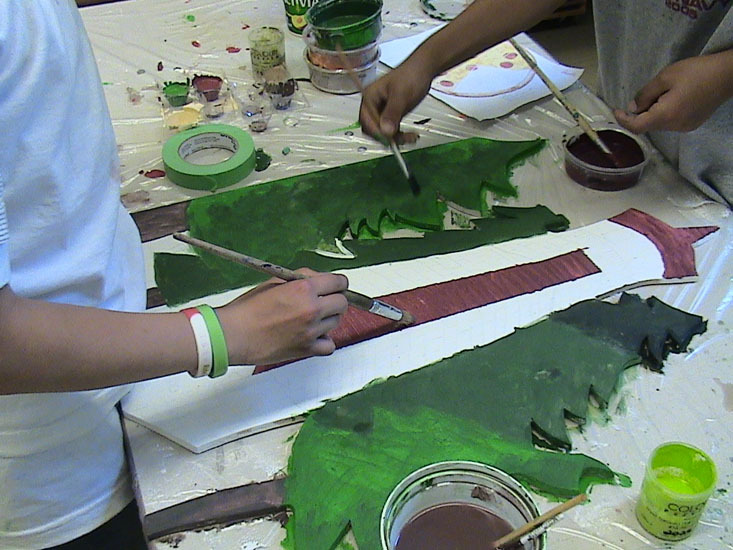 Hands-on experiences in art-making are integral to this, as is looking at and interpreting images, objects and events. 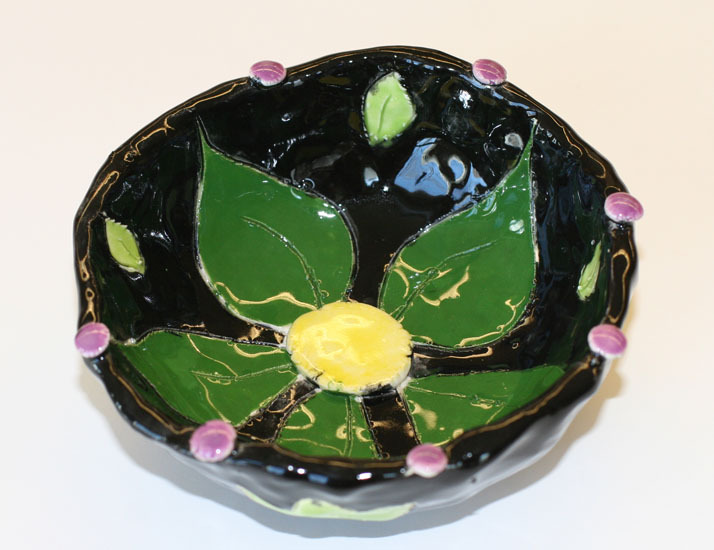 Central to my teaching philosophy is a desire to create personalized experiences for learners that ignite enthusiasm and promote creativity as an approach to lifelong learning. 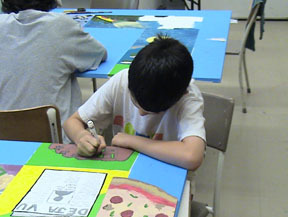 To achieve this, I use strategies that promote individual meaning-making in addition to studio skills development, encouraging learners to work from their own starting points and interests. 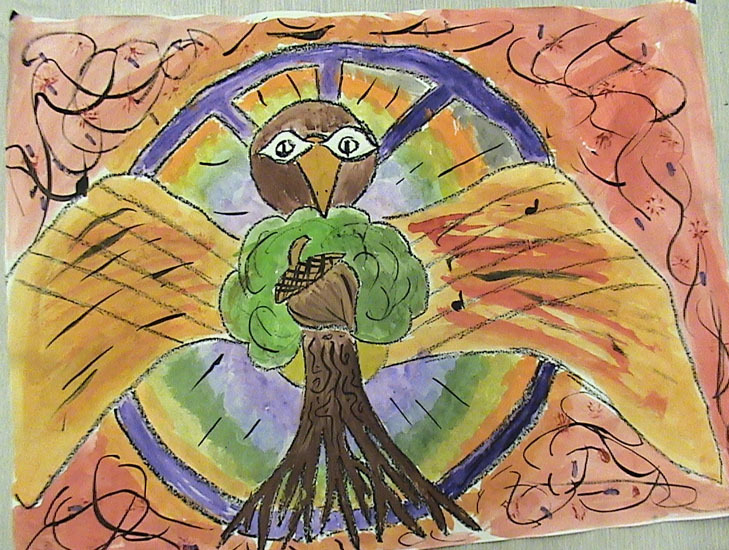 Focusing on their lived experience and existing knowledge, I work towards strengthening learners’ artistic confidence. 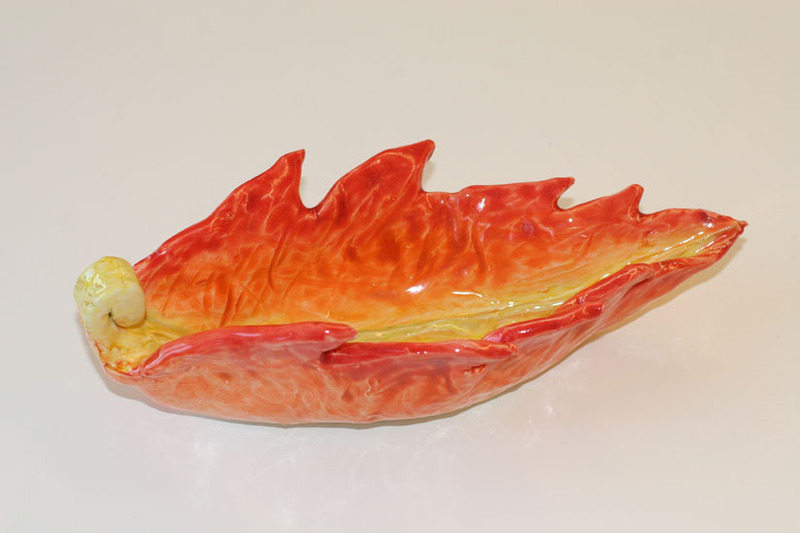 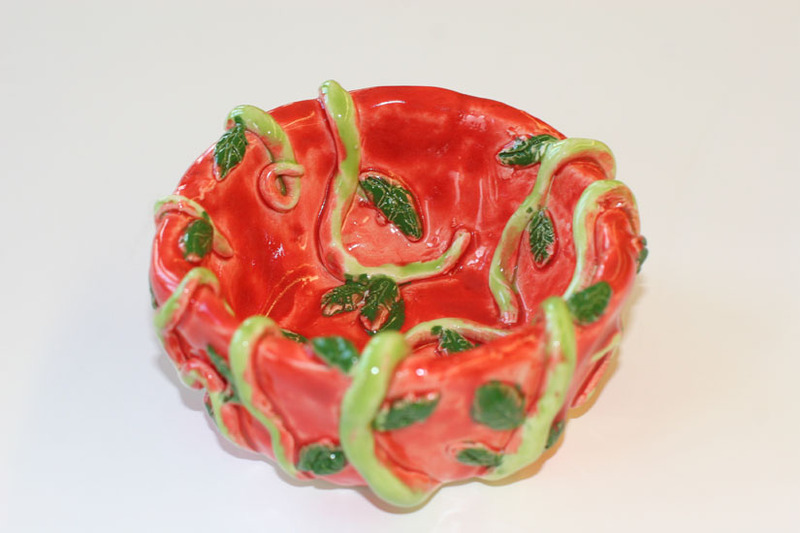 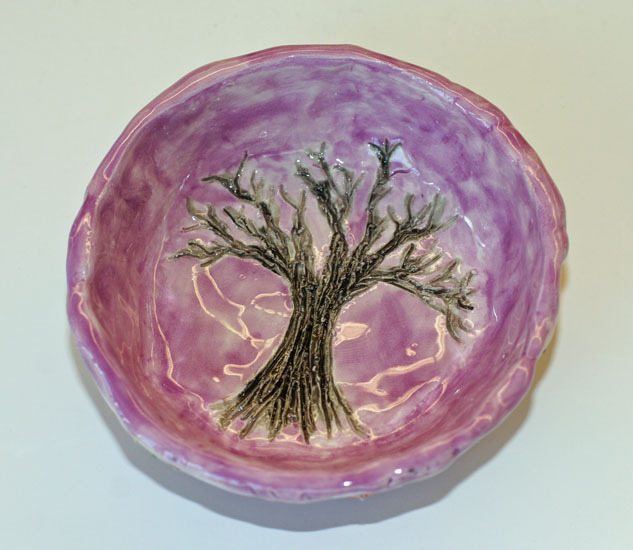 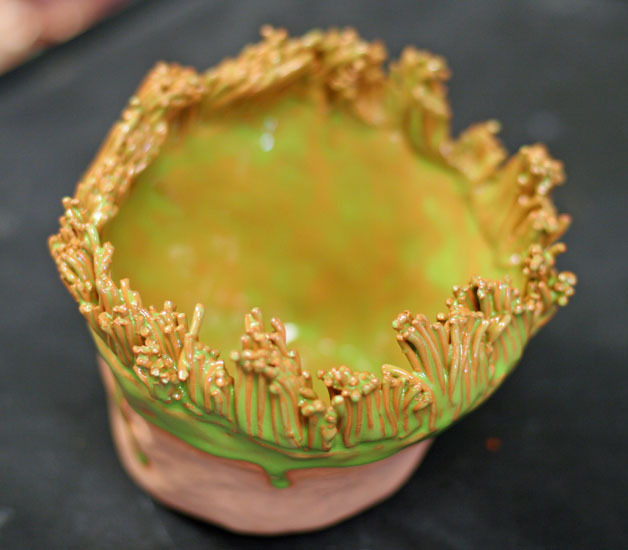 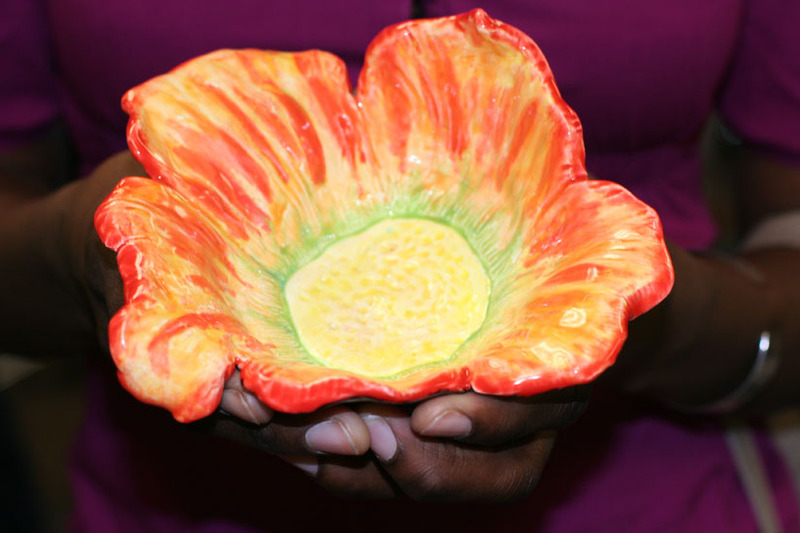 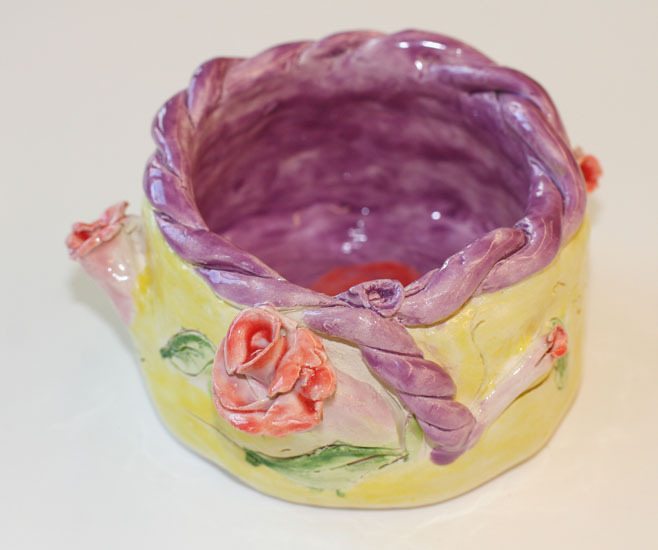 These creative bowls were made by B.Ed students for an annual Empty Bowl fundraiser. 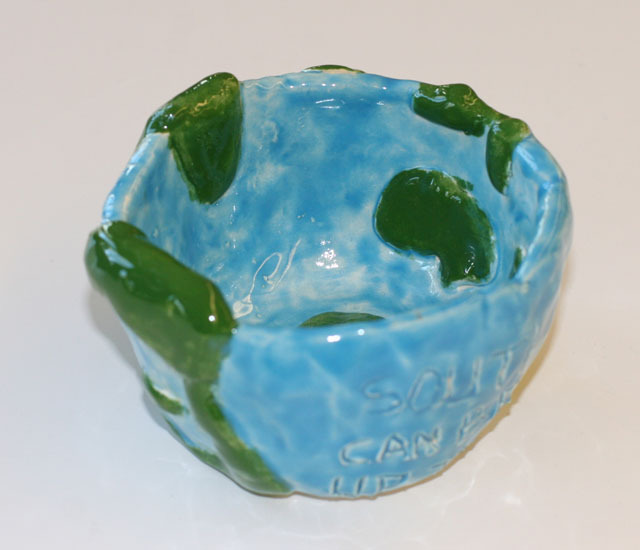 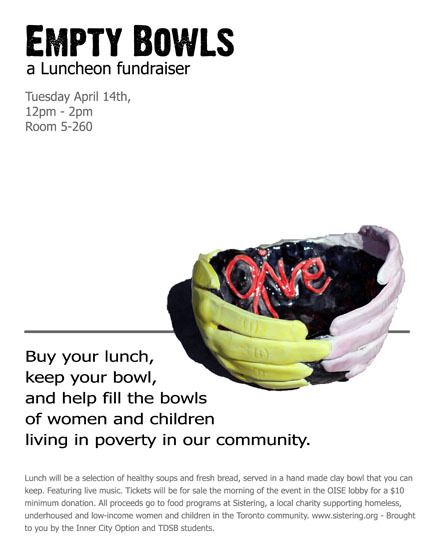 Inspired by the big idea of ‘change’, students created clay bowls that were given away as a part of an event to raise awareness about hunger and poverty in their community. 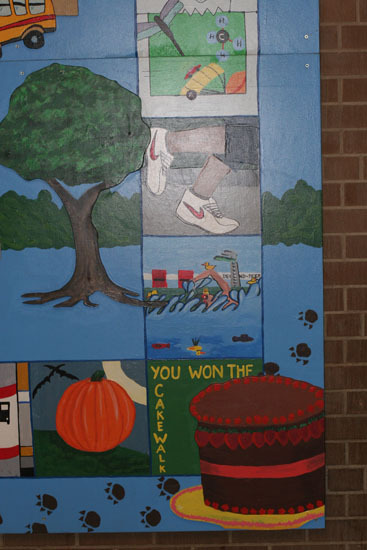 This wall-sized mural was created as a way to commemorate a graduating class’s memories of their elementary school. 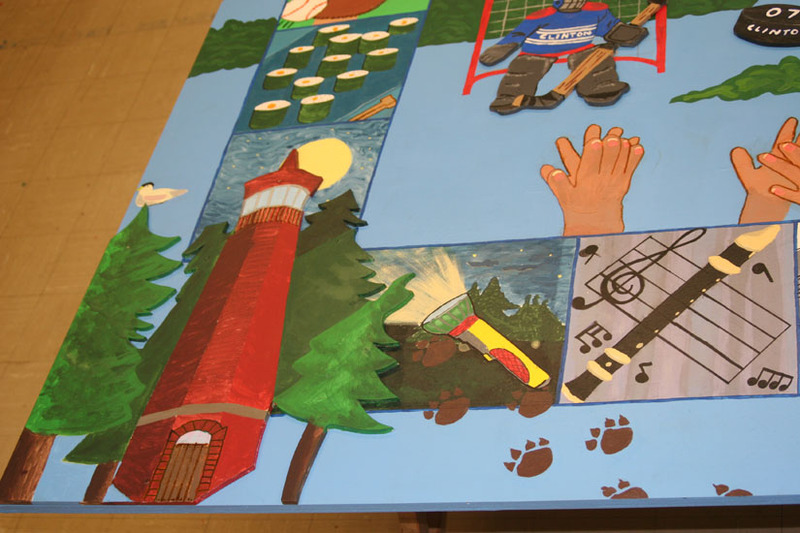 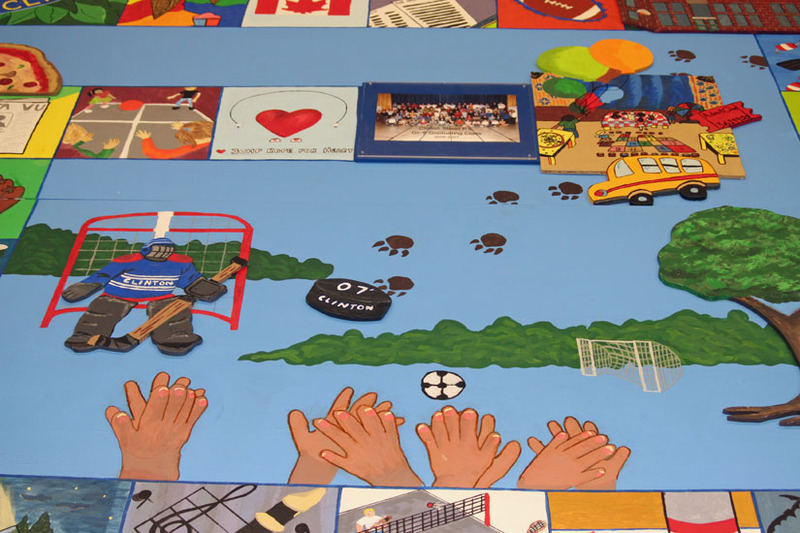 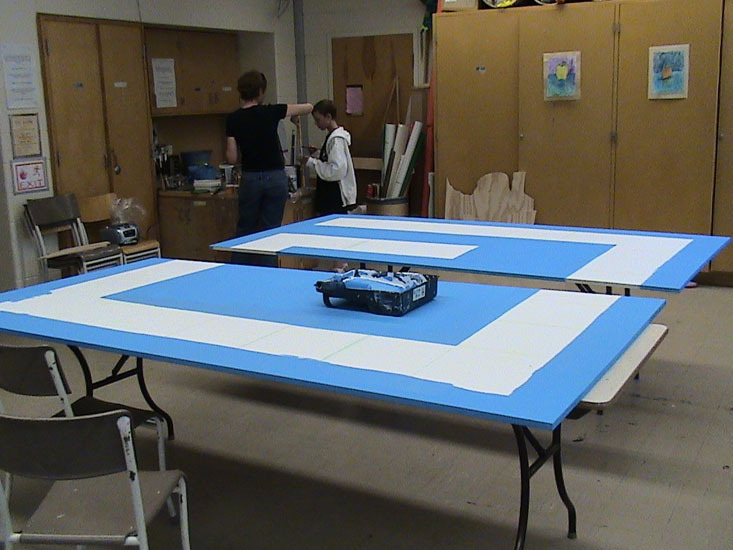 Designed as a giant board game, it shows the key events, trips and symbols of their years in grade seven and eight. 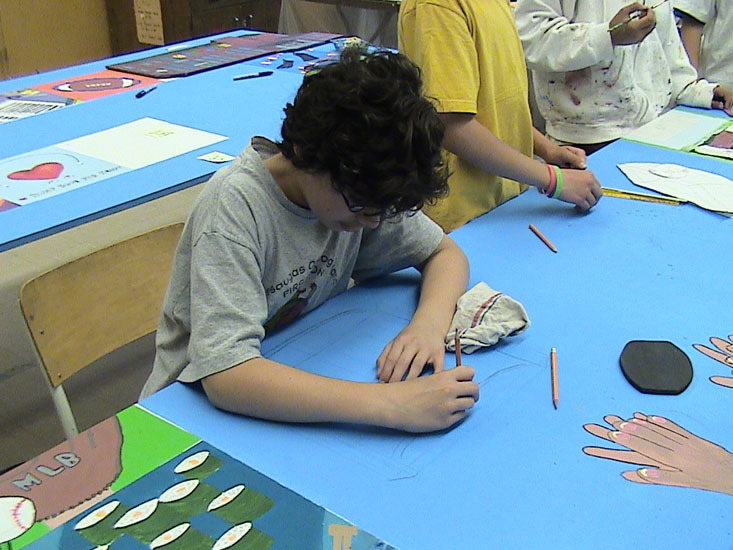 This series of lessons examined self-portraiture through the study of native artist Norval Morrisseau’s paintings. 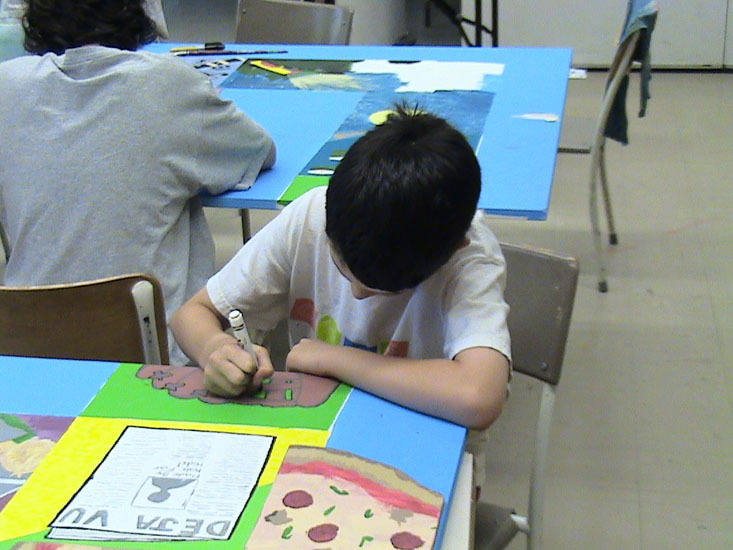 These grade five students created their own self-portraits using animal imagery to symbolize their own traits and talents. 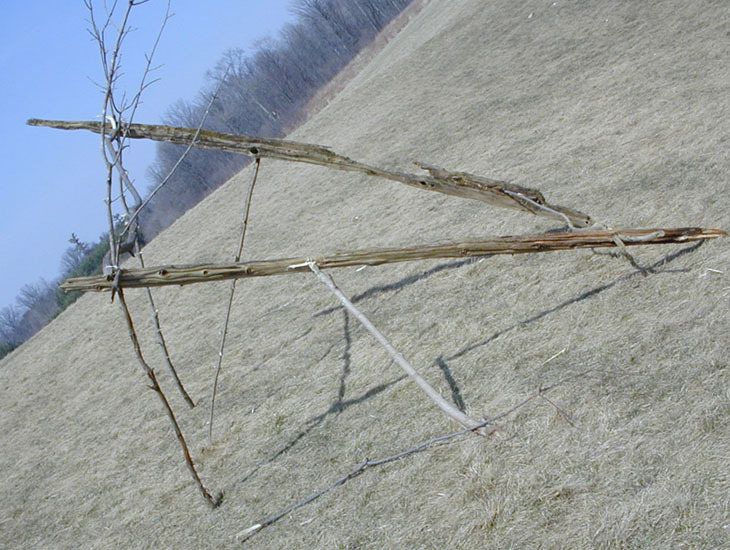 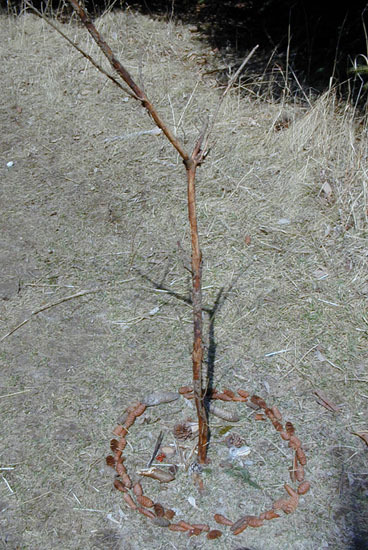 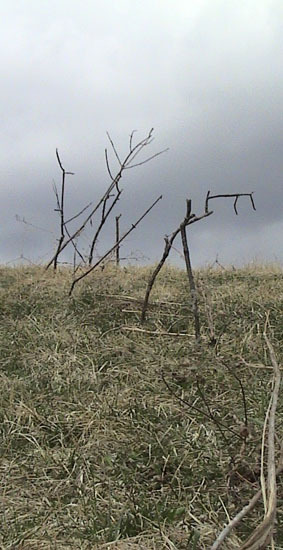 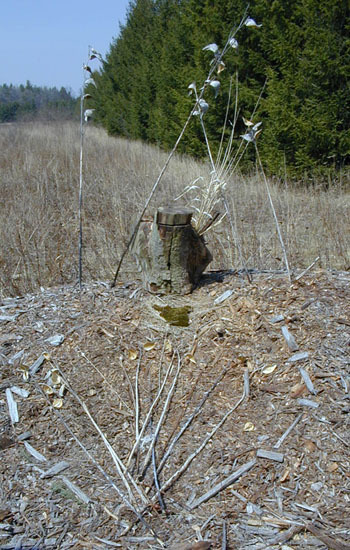 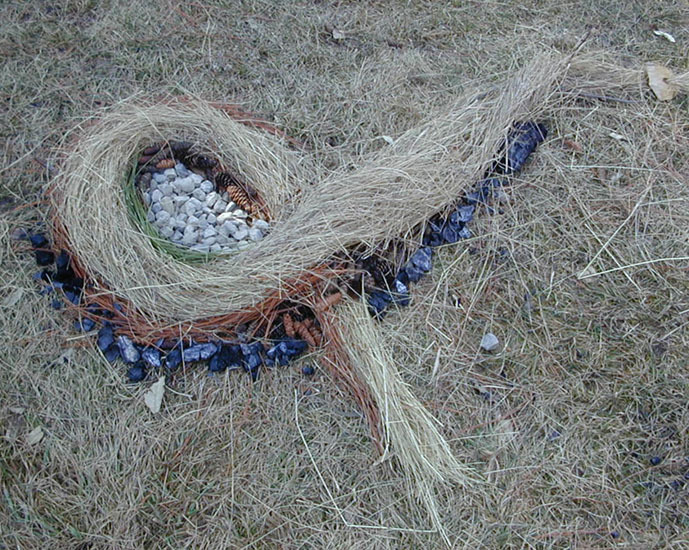 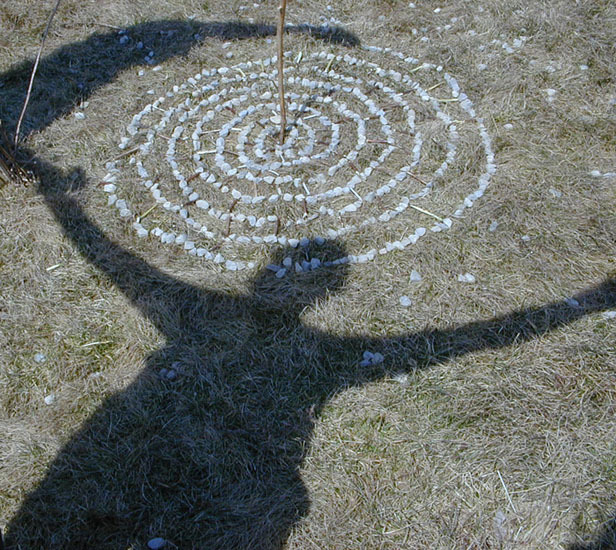 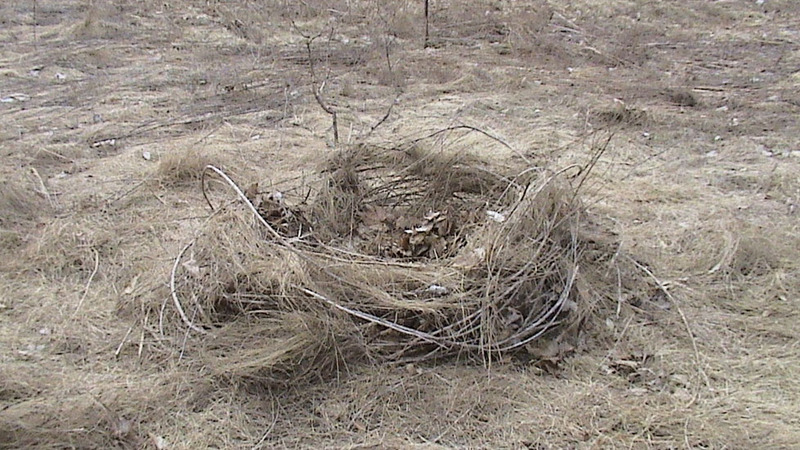 These nature-based artworks were created as year-end reflections by B.Ed students. 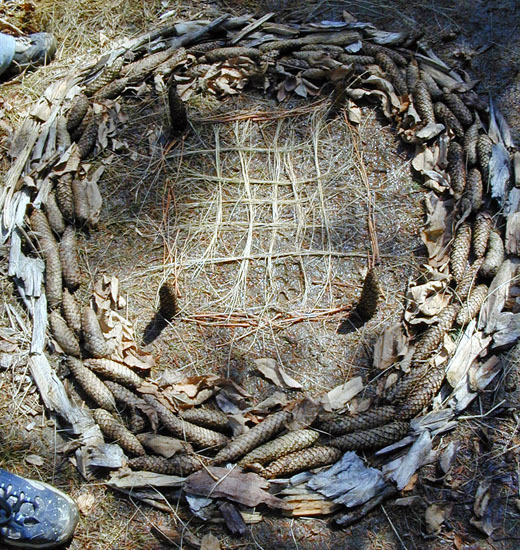 Inspired by the work of Andy Goldsworthy, the students used natural materials found on site to capture their feelings and thoughts about their preservice training. 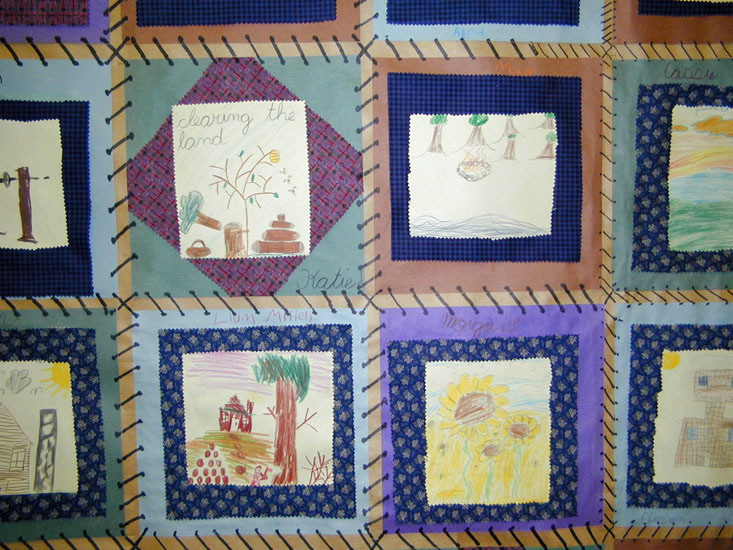 This collaborative artwork was a culminating project for this class’s study of pioneer life. 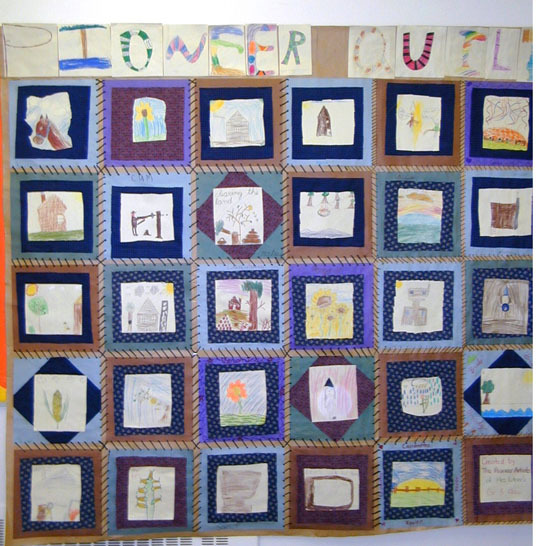 Each student made an image symbolizing one aspect of pioneer life, and then the images were mounted ion fabric and kraft paper into a wall sized paper quilt. 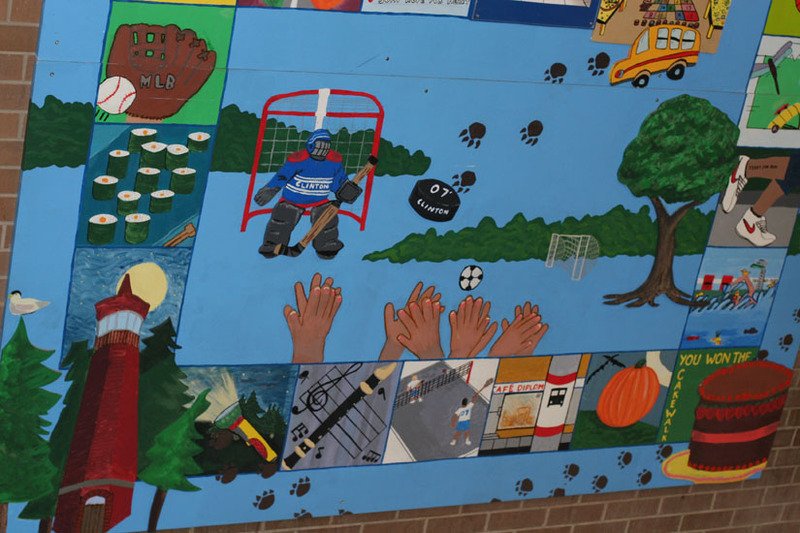 This large clay and wood installation hangs in the front entrance of an elementary school, and was created by two classes of grade two students. 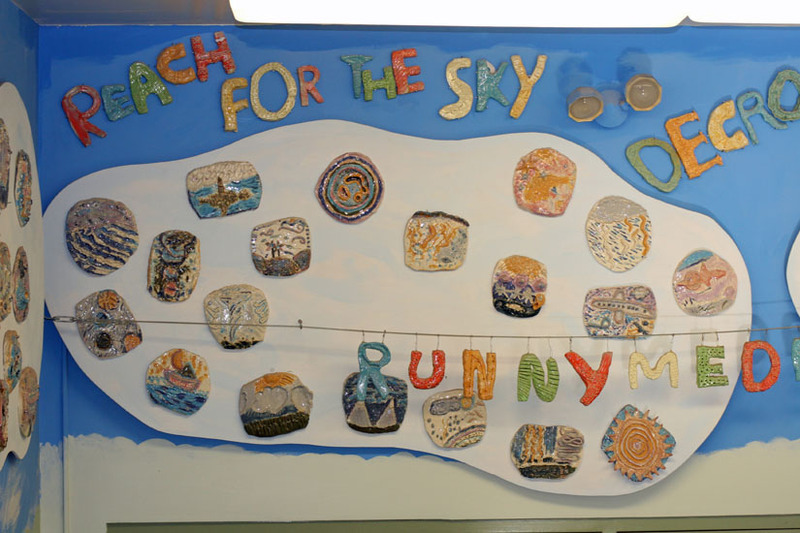 The clay relief sculptures show images of weather and celestial events, and encourage fellow students to ‘reach for the sky’ in their studies. 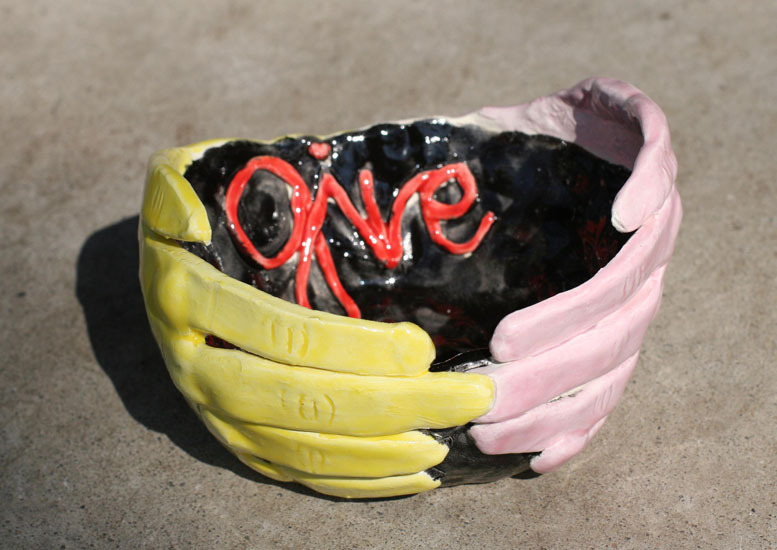 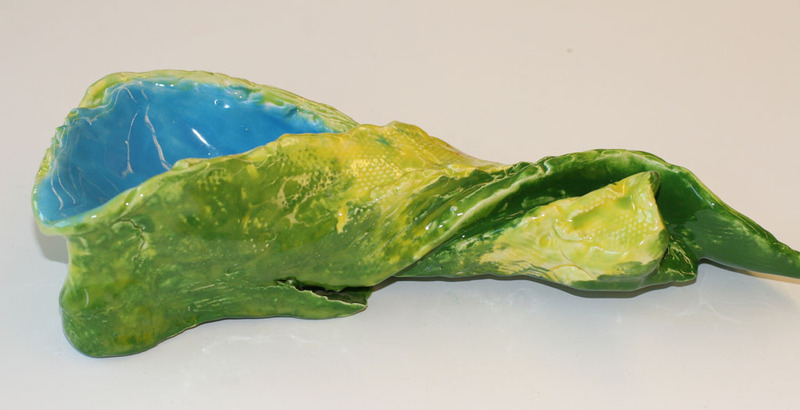 This project was created in collaboration with clay artist Andrea Piller. 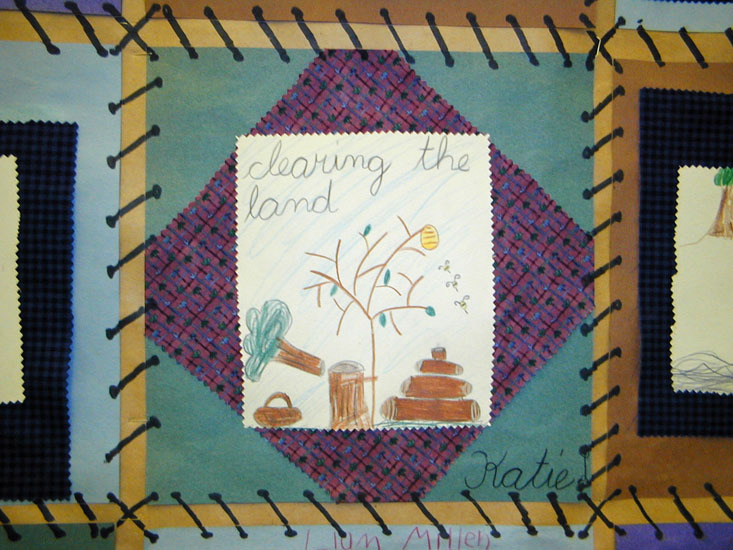 This series of artworks were created as part of a unit on medieval life as part of the social studies curriculum. 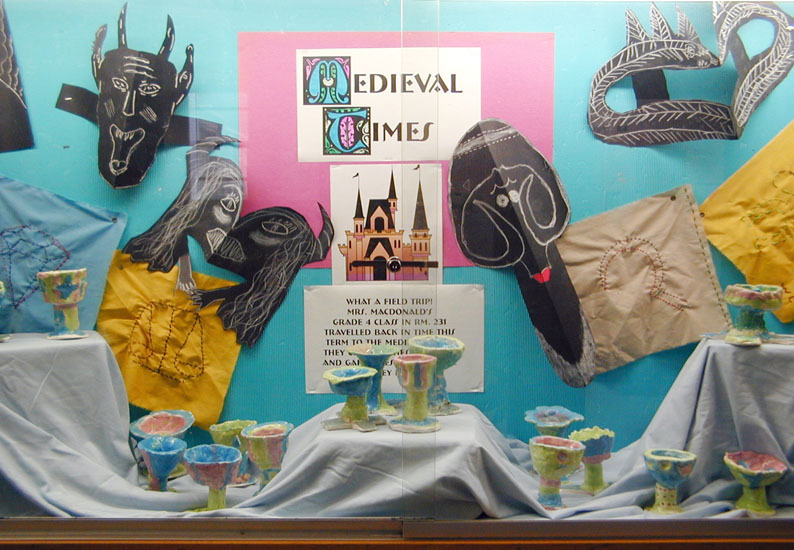 The individual projects of clay chalices, paper gargoyles, and hand-embroidered napkins were used in the culminating event of a medieval feast.